For the ninth straight year, Rodney Strong Vineyards continues its support of the wine blogging community via the Wine Bloggers Scholarship Fund. Specifically, Rodney Strong sponsors the Rodney Strong Wine Blogger Scholarship, which assists up-and-coming bloggers that display quality, quantity, consistency, and a community spirit in their work. This year, Rodney Strong has gone above and beyond, in supporting the Rodney Strong Scholarship but also by supporting #winelovers against cancer and providing a supplemental scholarship grant via their sponsorship of 100% natural recycled cotton canvas swag bags. Cancer is close to Chris’ heart, and we are thrilled to have his support this year. Be sure to stop by the Scholarship booth at Friday’s Expo Lunch and pick up bag, complete with Rodney Strong swag! If you want to augment your experience, a donation to the scholarship will also provide you with a loaded bag full of fun WBC goodies you are sure to enjoy for years to come. Stay tuned for more fun from Rodney Strong at #wbc16! Amanda Barnes, of Around the World in 80 Harvests, is the recipient of the 2016 Rodney Strong Wine Blogger Scholarship. Last year, Matt McGinnis was the inaugural recipient of this very special grant. Founded over 50 years ago, Rodney Strong Vineyards is a family owned winery that grows and produces wines exclusively from Sonoma County grapes. The winery was the 13th bonded winery in the country, and it aspires to conserve and protect the environment through sustainable practices, solar power, and fish friendly farming. 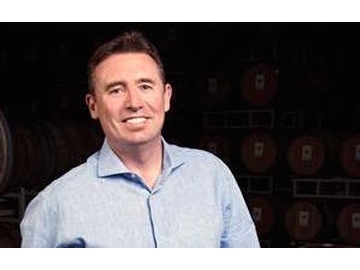 This year, Chris O’Gorman, newly appointment Director of Communications for Rodney Strong, will be representing the winery in Lodi. Be sure to say hello to Chris and the Rodney Strong team! We are excited to have your continued support, and look forward to seeing you in Lodi!